How Far is Spectra Peripheral City? Want to buy a Property in Hyderabad, have a look at Spectra Peripheral City developed by Spectra India Housing Private Limited, One of who envisioned a success story waiting to take shape in the retail business since 1995, This project Offers Plots for sale in Hyderabad at Shadnagar Locality, this place consists of the facilities required by plots buyers and essential amenities for those who want to build their own little paradise. 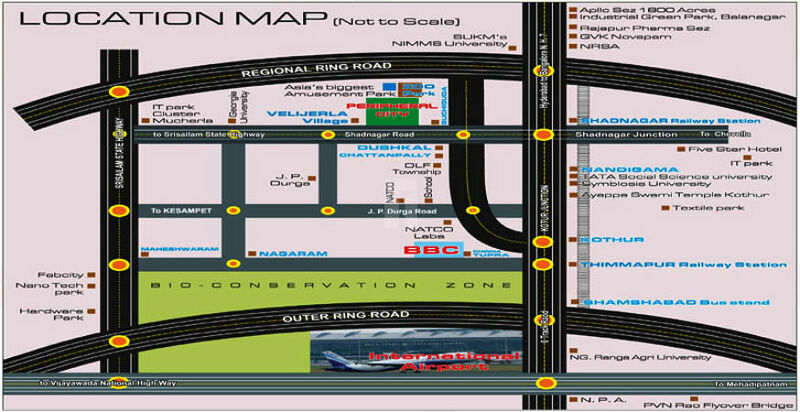 This Project offers affordable Plots for sale in Shadnagar, where plots land area is 120 Sq Yd, Shadnagar is few minutes’ drive from NH-44, Hyderabad-Bangalore highway and in the vicinity of Shadnagar railway station and municipality where daily needs are there in the proximity, well-known schools, hospitals, colleges are there in the proximity and hardware park, airport, outer ring road can be reached easily. Spectra Peripheral City Offers many amenities some of them are 2-Wheeler Parking, Car Parking, Children's Play Area, Rainwater Harvesting, Street Lighting, Black Top Road. Spectra India Housing Private Limited started its journey in the year 1995, They are rapidly growing to become the leading property developers in South India, Delivering everything with quality and on time value for money. Their moto is quality, commitment and performance. an example for their work is Spectra Metro Heights in Hyderabad at Nagole locality. They are focusing both on residential and commercial projects covering all requirements of ISO 9001:2000. To this effect, quality records are maintained methodically and carefully. They encourage customer feedback and reviews so that corrective actions can immediately be put in place to provide full satisfaction to their clients and they make sure all the environmental safeguards are addressed. They have constructed many projects some of them are Spectra Peripheral City in Shadnagar and Surabhi Gold Premium in Yadagirigutta Hyderabad. Their vision is to set up a world class standard in real estate industry and laying strong foundation for the future. Their mission is to inspire the market and impress our customers with an impression of integrity and credibility by achieving complete customer satisfaction. Passion is our strongest motivator. They are alert to new ideas, eager to learn more and positive towards setbacks. They are driven to break barriers and set new benchmarks. Passion pushes us to explore possibilities, so They can give customers more than they expect. If there is an innovative way of doing something, they will find it. they are about finding newer ways of setting benchmarks. We approach every task ahead of us with an attitude of never say never.